The shares of Astral Poly Technik hit a new high of Rs 1,233, up 6 per cent, on the National Stock Exchange (NSE) in intra-day trade on Thursday, after shareholders approved a scheme to amalgamate Rex Polyextrusion which manufactures and supplies corrugated and other plastic piping solutions. The stock surpassed its previous high of Rs 1,210, recorded on January 7. In the past five months, Astral Poly Technik (ASTRA) has outperformed the market by surging 49 per cent from its recent low of Rs 826. In comparison, the benchmark Nifty 50 was up 6 per cent during the same period. The stock had hit a 52-week low of Rs 815 on October 8, 2018 in intra-day trade. The company had posted sales CAGR of 32 per cent, an Ebitda (earnings before interest, taxation, depreciation and ammortisation) CAGR of 31 per cent and a PAT CAGR of 26 per cent over FY08-18. For the first nine months (April-December) of FY19, ASTRA had reported 23.8 per cent year-on-year (YoY) growth in its consolidated net profit at Rs 137 crore. Operational revenue grew 21.3 per cent at Rs 1,740 crore on YoY basis. Ebitda margin expanded 145 bps at 15.9 per cent from 14.46 per cent in same period last fiscal. As part of the consolidation and better inventory management, the company has closed Coimbatore and Bangalore Depot and dispatches to South take place from Hosur factory from January onwards. With new product addition Adhesive and pipe segment, analysts at Dolat Capital feel that the revenue growth, along with margin profile, should get better. With high growth trajectory and expansion in return ratios, valuations will remain expensive. “During Q3FY19, macro outlook was bleak due to the liquidity crunch and overall weak market sentiment. We believe that with improvement in the liquidity situation, market volume outlook should improve and our recent channel check suggests that January has been marginally better than Q3FY19. We expect ASTRA volume growth to come back in double digits in the ongoing quarter with the protection of margins. Investments in the brand have enabled ASTRA to maintain premium pricing and protect margins,” the brokerage firm said in result update with ‘buy’ rating on the stock and target price of Rs 1,378 per share. At 10:02 am, the stock was trading 3.6 per cent higher at Rs 1,214 on the NSE. In comparison, the Nifty 50 index was down marginally by 0.05 per cent at 11,047 points. A combined 40,757 equity shares have changed hands on the NSE and BSE so far. Astral Poly Technik was the first company to launch CPVC pipes in India in the mid-90s when the piping segment was dominated by galvanized iron (GI) and polyvinyl chlorinated (PVC) pipes. 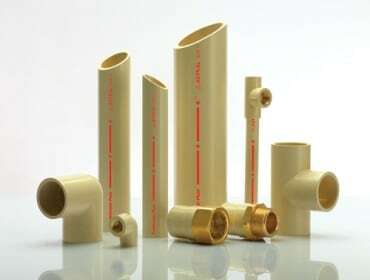 The firm was also the first to introduce products such as as lead-free uPVC column pipes and bendable pipes in India.